Affirmative action policies have managed to reduce resource inequalities between different socioeconomic groups within school sectors, but have been much less successful in reducing inequalities between sectors. The Israeli educational system has been undergoing some major transformations. These include demographic changes within the Arab Israeli and Haredi (ultra-Orthodox) sectors that have in recent years gone from being a small minority to constituting nearly half of the primary school system today. The evolution of public education in Israel is examined in greater detail in Nachum Blass’s chapter “Israel’s Education System — A Domestic Perspective” in the Taub Center’s The State of the Nation Report: Society, Economy and Policy 2009 with some of the main points highlighted here. • The pay of teachers across Israel is uniform, with a slight advantage to teachers in the weakest regions. • The quality of new teachers, as measured by their performance on standardized psychometric tests prior to enrolling in higher education, is higher than that of the veteran teachers. • In relatively poor communities, the pay and cognitive abilities of teachers are above average for their communities and in many instances are even higher than those of members of other professions with an academic education. • The Social Survey of the Central Bureau of Statistics shows that on the whole, teachers have a high degree of satisfaction from their work (though a much lower degree of satisfaction from their pay). Over 90% of teachers report that they are satisfied with their work. Though further study is certainly warranted, it would seem that there is no crisis in the status of the teaching profession or in the abilities of new entrants to the teaching profession in Israel. Since the 1960’s, the Ministry of Education has made it a priority to reduce educational inequality by adopting “affirmative action” policies to provide additional education resources to disadvantaged pupils. These extra additions to the budget are meant to provide smaller classes, more class hours and increased teacher hours for the disadvantaged population. This policy has been effective in reducing gaps in these areas within each education sector, but has contributed little toward lowering inequality between sectors. This outcome is partially due to the Ministry of Education’s tendency to focus its attention on the secular and religious Jewish State sectors at the expense of the rapidly growing Arab and Haredi school sectors. The figure below focuses on one of the affirmative action targets: class size. It divides primary school students into groups based on their socioeconomic background: the upper third, middle third, and weakest third. Average class size is indicated for each group. The figure presents the outcomes separately for each sector of the education system: Arab education, Jewish State secular system, State-Religious system, the “Independent” or mainstreamHaredi system, and the Sephardi Haredi “Mayan HaChinuch HaTorani” system. Within each system, the affirmative action program is relatively effective. The upper socioeconomic third in each sector has the largest class size and the weakest third the lowest class size. 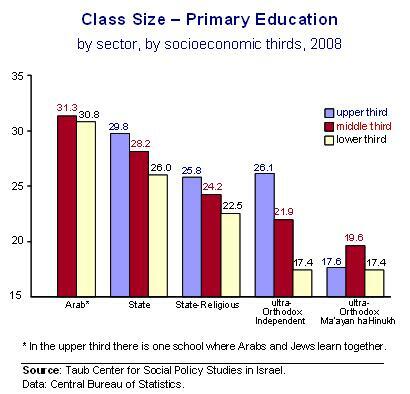 The only exceptions are the SephardiHaredi system, the smallest of the five, where the better-off students have smaller classes than those in the middle, though even here the poorest students have the smallest classes. Not enough Arab students from the top socioeconomic third were represented to enable its inclusion in the graph. While affirmative action policies appear to have an effect within sectors, the figure above shows that affirmative action policies have been less effective between sectors. Class size among the least advantaged students in the Arab sector is larger than that of the most advantaged students in the other sectors. Furthermore, the extent of affirmative action within the Arab sector is minimal; the difference in class size between the two thirds is less than one student, whereas in all the other sectors it is at least two students. Instruction hours show a similar pattern. Each sector provides more hours of instruction to the lower socioeconomic levels, but the total number of hours of instruction between sectors varies widely. The number of hours of instruction given to the most disadvantaged students in the State-Religious system, 2.4, is 50% greater than the number of hours provided to the most disadvantaged students in the Arab sector, 1.6. These findings were in the primary education system. Similar trends are found in secondary education. One place that affirmative action does not provide an advantage to poorer students is in measures of teacher quality. Teachers in higher socioeconomic areas tend to have greater seniority and higher levels of education than teachers in schools with disadvantaged students. However, the gap in teacher quality in Israel is smaller than the gap in other countries. That Ministry of Education’s policies favoring disadvantaged students appear to have had an impact not only in class hours and class size, where the disadvantaged students have a clear advantage, but also in teacher quality where the gaps are lessened due to policy.